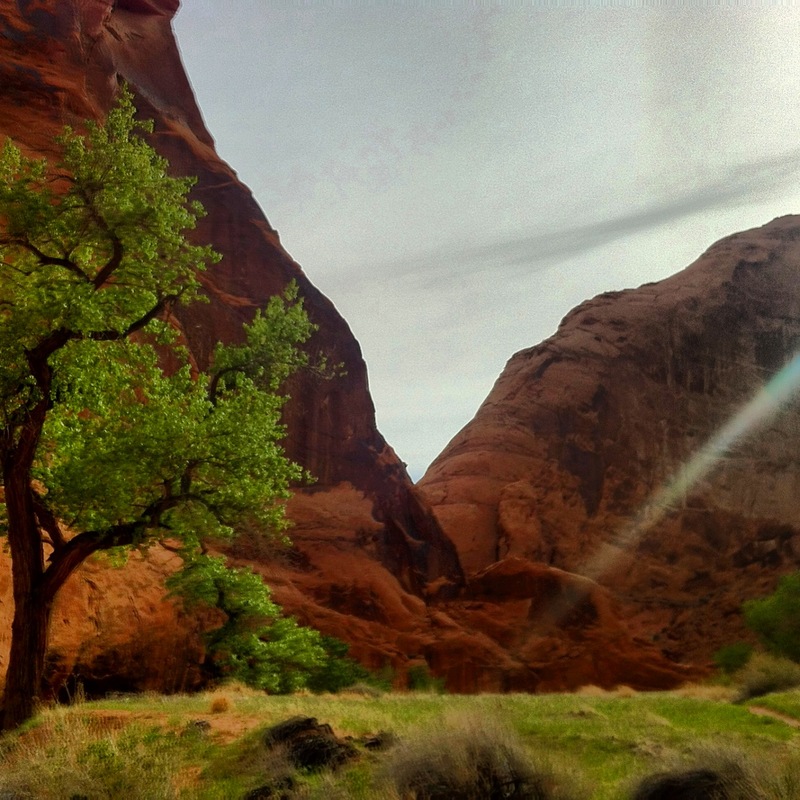 I Hiked Coyote Gulch..AND BARELY MADE IT OUT ALIVE! My oh my have I had a lot going on since the last time I posted! My half marathon is in about 10 days and I totally screwed up my training schedule because I went out of town this past weekend on a little hiking excursion, but I’m working to get it back on track! Before I get into that, this hiking trip I went on was an excursion indeed. I’m not sure if any of you have heard of it, but Coyote Gulch right outside of Escalante, Utah is always being talked about as a must do hike in the US. When I read that recently, I decided that we must do it right now :). When I get excited about something I have the tendency to feel that I need to do whatever it is right away. Before heading down to Escalante we did a lot of research and preparing for the trip. 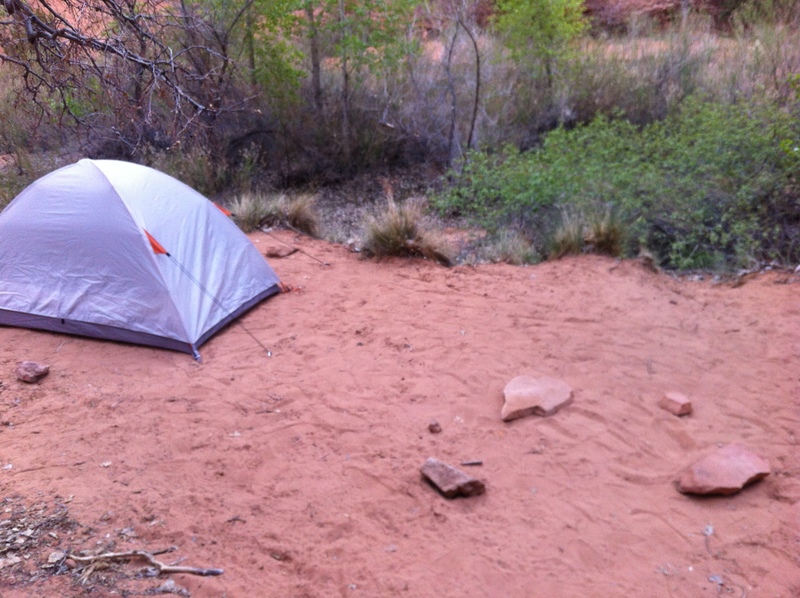 Everything we read said the best way to enjoy the hike was to do it in 3 days/2 nights. So, that is what we planned and prepared for. We took off work Friday and headed out of town at 6am. Very ambitious, I know. Fast forward until about 2pm that day, we finally got to the trailhead! We hiked in 7 miles on Friday to get to the spot we decided to camp. 7 miles usually doesn’t phase us on a hike, but we both had our >20lb. backpacks on and the entire hike is done through sand and water. 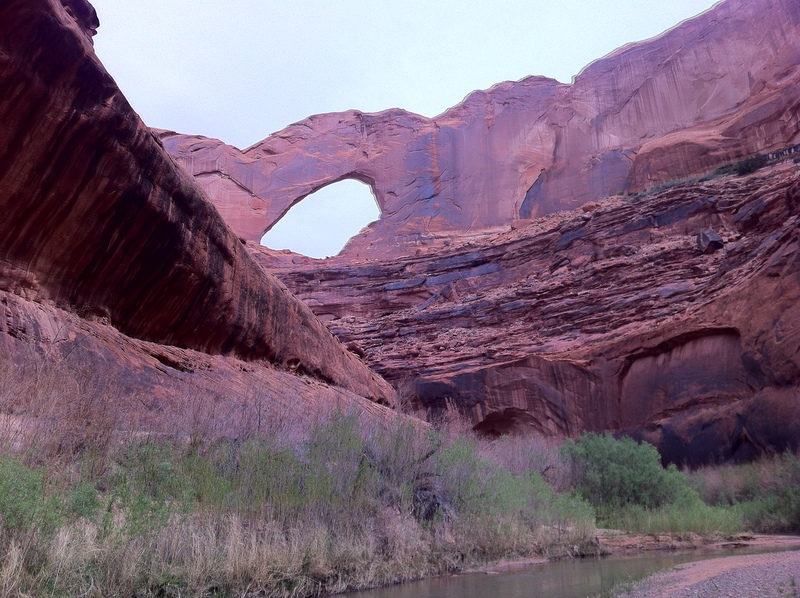 The second day you hike 6 miles to a place called Stevens Natural Arch. This portion of the hike is absolutely awesome. It was still entirely through sand and water, but every bit worth it because of the scenery. Plenty of pictures below. This is where the story gets interesting. 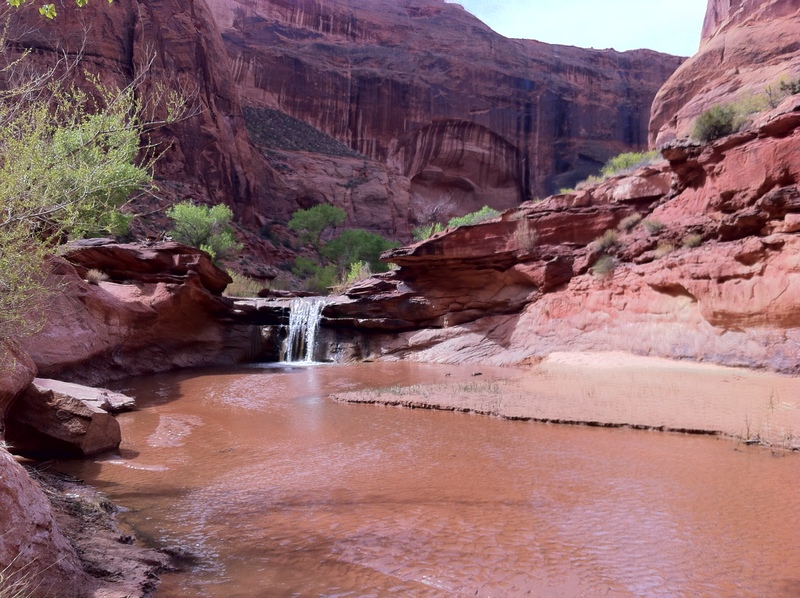 About half way through this 6 mile (one way, so really 12) hike we decided that when we got back to camp we were going to pack up, head to the car and drive down to Moab, Utah to spend the day hiking around there on Sunday. The hike is a strenuous hike and holy cow do they mean it. When we finally got back to camp after hiking 12 miles early Saturday morning/afternoon we were already exhausted and oh so sore! But at that point, we had talked about getting to eat real food that night so much that we were not going to let anything get in the way of that! We were booking it out of there. It was going to be the fastest 7 miles we ever hiked. WELL, somewhere along the way we forked right when we should have stayed left. Unfortunately, everything in the desert looks very similar so we didn’t notice it until we had already gone who knows how far in the direction. When we both spoke up and came to the conclusion that we didn’t recognize anything we made the decision to turn around. Mistake number 2. We didn’t backtrack far enough to find anything that looked familiar, we just jumped on the next trail we thought looked a little bit right and went even further (in the wrong direction) down that path. By this time we are fighting daylight and we are both so mentally and physically exhausted that nothing seemed right. When it finally got dark enough that we had to break out the headlamps, we made our way back to the last recognizable spot that we remembered passing and made the decision to set up camp and figure it out in the morning. One thing I will very proudly say, is that we both stayed very calm throughout the whole thing, not counting the thoughts in our heads that all came spilling out while we were safely in the car on the way back to civilization. I don’t know if anyone has ever been in the desert, on a plateau at night, but apparently that’s where you’ll find a nice little sand storm. But, I obviously made it out alive to tell the story. All we needed was a little rest and daylight and we made it on the first try Sunday morning. Needless to say, I might stay away from the desert for a little while. Maybe find some hikes with some clearly marked trails, no sand and who knows, maybe I’ll start paying better attention to where I’m going to hopefully avoid getting that feeling ever again. Now, onto how this affected what was once a very disciplined half marathon training schedule. My original plan was that I would get back on Sunday morning from the hike and still get in my long run that evening (11 miles). Little did I know, my body was going to be aching when the hike was over. There was no way I was getting off of the couch until I was forced to go into work Monday morning. So, I took Monday off as well, hey it’s an off day on the schedule! Tuesday I went back to the normal 4, but Wednesday I did 11 instead of 6 and I took the rest of the days off and did 12 on Sunday. It was a rough week! However, by doing my 12 on Sunday even though I had just done a long run a couple of days before, I got myself back on track. I took Monday off, did 4 yesterday and got in my 6 today. Things are looking good! I am getting really anxious for the race next weekend, it’s going to be hard but I still have faith in my goal of finishing the race in under 2 hours. Fingers crossed! My Favorite Running Gear & Race Results! It’s the First Official Day of Summer! How Will you Celebrate? Still Injured – Now What? !